Do you plan a trip to France for your next holiday or even to live there? Or do you have opportunities to meet and chat with French people in your area? Then this guide is for you! Having a conversation in a foreign language is not just being able to put sentences together. It is also about having some knowledge of the sociocultural codes and customs among the people speaking that language so as not to offend or create embarrassing situations. My goal in writing “How to improve your French conversation skills” is to help you be a better conversationalist by raising awareness about everyday life French conversation etiquette. I was inspired to write this guide by a student who had come to me for brush up lessons before travelling to France. She already had an intermediate level in French and could handle general conversation. As we role-played some everyday life situations, she -unknowingly but repeatedly- said a few things which a French person could have found intrusive or inappropriate. This had nothing to do with her language skills. This book is NOT a phrasebook although I will go through some expressions that are said in specific situations. I will give you practical examples of cultural differences that you’ll need to be aware of as they may be different from the norm in your own country and culture. I also included tips to help you better understand spoken French. Finally, I give you my suggestions on how you can improve your French listening and French conversation skills. By the end of this book, you should be able to approach conversation with native French people more confidently. All you will then have to do give it a go and…speak! No book can do this part for you! Here are the topics that I cover! 2. Keep Small Talk….Small ! 12 Differences Between Written French and Spoken French: How we Actually Pronounce Things in Real Life! 1. Be patient. Don’t give up. 2. Pay attention to facial expressions, hand gestures, intonation, etc. 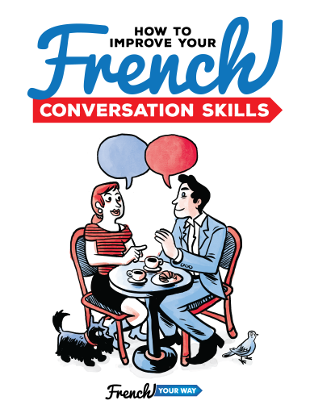 “How to improve your French conversation skills” is available in eBook (PDF file, 51 pages) and in audiobook (over 1 hour of recording). If you don’t have much time for reading, I suggest you get the audiobook and I’ll keep you company on your commute or at the gym.